TiS 671 / AoV2-121 Made in God's Likeness (Patricia Lewis / Alister Spence) Excellent Australian imagery. This is one of my very favourite songs. It is not difficult if you have a good musician at the helm. If it is new to your congregation, they will be able to join in on the verses by the time you get to the 3rd one. The change in tone with the verse really lifts this song. Lyrics and a synthesizer sound sample. I had an interesting discussion with a friend at church who doesn't like the line "Called to create a new world for the Lord", and I realised that I was interpreting the line quite differently to her. I think of it as a world being created that is "for God", like when you vote for someone. W&R629 / Cha511 Strong Gentle Children, God made you beautiful (Dean Damon) The words to this are excellent - I don't actually know what the tune is like, but if you have a copy of either book, I think you should check it out. Online Resource Creator of this great land we adore you / Doxology (Ross Langmead) A strong favourite in our congregation. A well-loved song, but suprisingly, I don't think it's published anywhere. Lyrics & sheet music. Seeds of Faith Breath of Life (a creation story) (Richard Bruxvoort-Colligan). A simple chant, with a narration of the creation story. The chant could be used on its own, but the creation story is also very beautiful. “Breath of life, breathe in me, you have created all I see… you have created even me”. Take a look at the website and listen to the sample to see what it’s like. Click on Music, then Seeds of Faith. Good for kids. *MV157 I am a child of God (Bruce Harding) A simple song with powerful words. Very easy to learn. I would just sing the first verse this week, as a round. Good for kids. *Online Resource How Great is your name! (Richard Bruxvoort-Colligan) A fun Psalm refrain for kids with a cantor part. Good for kids. Sound sample and sheet music. PfAS008E O Lord Our Lord how majestic is your name (Alfred Fedak) Psalm response. ATW 462 When I consider God's design (Hand in hand) (Norm Habel) Good words of all creation celebrating together. Tune is good, too. Lyrics. 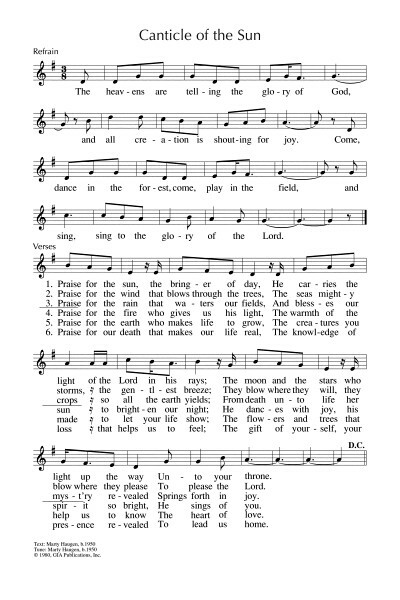 VU730 / URW229 God our God your glorious name (Psalter / Sherwin) Inclusive paraphrase of the Psalm with a joyous chorus. VU732 O God our God how glorious is your name (Guimont) Inclusive responsive paraphrase of the Psalm with a simple refrain. TiS 90 / AHB 44 / UMH60 / VU867 / GtG806 / PH253 / A&M673 / CP346 / CP(E) 473 / W&R79 / Cha20 / PfAS146A / 82Hml-429 / StF079 / MP320 I'll praise my Maker while I've breath (Isaac Watts) A great classic hymn. Most sources are not inclusive; Voices United and Chalice hymnal are! Lyrics and sheet music samples. Oldy-but-a-goody. NCH Psalter008 How majestic is your name in all the earth (Lee Dengler) A very simple refrain and chanted Psalm. *TiS 650 / ATA 191 / CH694 / A&M604 / NCH539 / VU595 / ELW659 / AA08 / SFFS 2222 / HPP442 / GtG727 / G(II)476 / GC683 / GC(II)661 / G(3)751 / CP500 / CP(E) 393 / W&R391 / Cha490 / SP263 / URW117 / StF611 / Lau924 Brother, sister, let me serve you / Won't you let me be your servant? (Richard Gillard) I think you all know this one. Lyrics. NCH has a nice turn on the lyrics with "Won't you let me be your servant?" as the first line. TiS 691 Faith will not grow from words alone (Elizabeth Smith) This is an excellent hymn about doubting and struggling in faith. The tune is familiar and I find the words very helpful for thinking and doubting Christians. Lyrics. NCH590 / CH621 Spirit of Jesus, if I love my neighbour (Brian Wren) Challenging words of offering help from a position of privilege and seeking to be set free from the entrapment of possessions “If I am hugging safety or possessions, uncurl my spirit as your love prevails, to join my neighbours, work for liberation, and find my freedom at the mark of nails”. Could also be sung to the tune PERFECT LOVE if your congregation would have trouble with the newer tune. TiS 721 / Iona (LFB) / URW431 / StF344 / Lau124 He became poor that we may be rich (Iona) A simple chant. Timing is a little bit tricky, so you will need to take a little time to teach it initially. This has gorgeous parts if you have some singers. Sound sample. *MV155 Unbounded spirit breath of God (Brian Wren) Good solid words of commitment to faith and work; a communal song. Simple hymnlike tune. NCH70 / UMH660 / VU389 / WoV719 / ELW526 / A&M445 / HPP486 / GtG409 / PH461 / GC741 / GC(II)737 / G(3)843 / CP(E) 301 / W&R1 / Cha280 / STB049 / StF025 God is here as we your people (Fred Pratt Green). Great lyrics, but not inclusive in all sources and set to a range of tunes. I like it sung to the familiar tune ABBOT'S LEIGH. Lyrics, sound sample and sheet music sample. New words to old tunes. Online Resource (Tune In) Community (Dave Brown) A great and easy to sing song about being neighbourly and living for and with others. "A glass of water shared with the thirsty, this is community". Sound samples and free downloadable songbook Good for kids. TiS 414 / CH616 / UMH192 / VU582 / A&M265 / HPP134 / PH433 / GC550 / CP(E) 198 / Cha257 / StF398 There's a Spirit in the Air (Brian Wren) A good song of getting the business of following Christ done. Speaking out, caring for others, being changed. Good, joyful tune too. Hymnals vary in the tunes they use. I like the TiS tune, which I tend to think of it in 6/8 instead of 6/4. Lyrics and a sheet music sample.